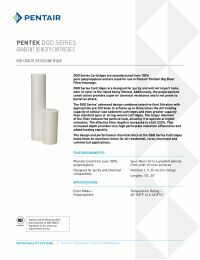 The 20" Pentek DGD-5005-20 Dual Gradient Density Sediment Filter is manufactured from 100% pure polypropylene, and is sized for use in the Pentair Pentek Big Blue Filter Housings. The DGD Series filter cartridges feature high capacity and dirt-holding design, and will not impart taste, color, or odor to the filtered liquid. The polypropylene construction not only offers advanced sediment filtration, but also superior chemical resistance and bacteria protection. The design and performance capabilities of these cartridges make them an ideal choice for all residential, rural, commercial, or municipal applications. This filter will fit Pentair® Pentek® Big Blue®, 3M/Cuno®, Culligan®, Filterite®, Harmsco®, Keystone Filter™, Watts®, and most heavy duty filter housings. Dual-Gradient Filtration. The dual-gradient is an all-in-one pre and post filter, eliminating the need for a step-down filtration system in your home. The 50 micron outer layer removes larger sediment, which reduces the load of the 5 micron inner layer. This allows the filter to operate more efficiently and consistently, and adds to the filter life.